Seniors Warned About New Medicare Card Scams-Truth! - Truth or Fiction? The Centers for Medicare and Medicaid Services (CMS) is issuing new Medicare cards to all beneficiaries in April 2018. 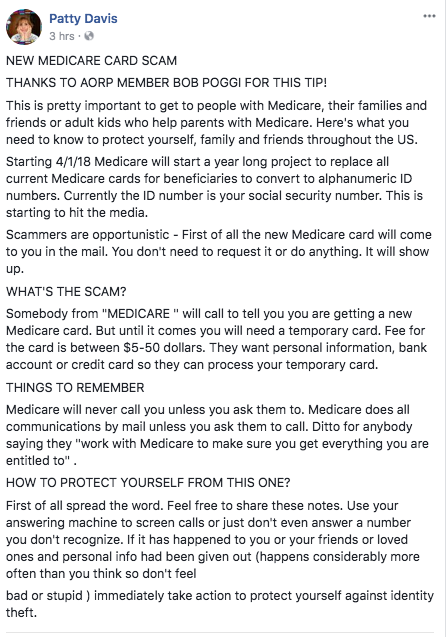 Ahead of the planned rollout, warnings about new Medicare card scams circulated on social media and via email. We haven’t been able to confirm any specific threats — but it’s important for Medicare beneficiaries to remain vigilant of potential threats. There were already a few reports of new Medicare card scams by February 2018. One social media post warned that scammers had contacted beneficiaries by phone to sell them a “temporary” Medicare card for $5 to $50. The scammers then request bank information and other personal details. The warning has been attributed to an AARP member named Bob Paggi, but we were unable to confirm his identity or the validity of the threat. Regardless, it’s important to note that Medicare will never request personal information in an unsolicited phone call or email.